With Friday’s crazy rains I had doubts about Saturday’s Northface Endurance Challenge races. Our team (me, hubby + friends) a.k.a., “The Comeback Kids,” participated in the marathon relay along with an impressive 66 other foursomes. Despite (or maybe because of?) the mud and water-logged trails, we had a great time. The late start (11:00AM) allowed for an easy morning and gave me an opportunity to pack for downtime (we ended up bringing a ridiculous amount of gear…camp chairs, sunscreen, bug spray, a cooler full of drinks, enough food for 10 people, etc.). Needless to say, we were comfortably ensconced at the NorthFace Finish Festival area, enjoying the spectacular weather and scenery at the beautiful Algonkian Regional Park. This was our second year participating the Northface race series, and like last year, the course was a mixture of field, paved road, gravel, and trail. As expected, conditions were very muddy and each of our four runners had tense moments (including a lost shoe) with very slippery trails. 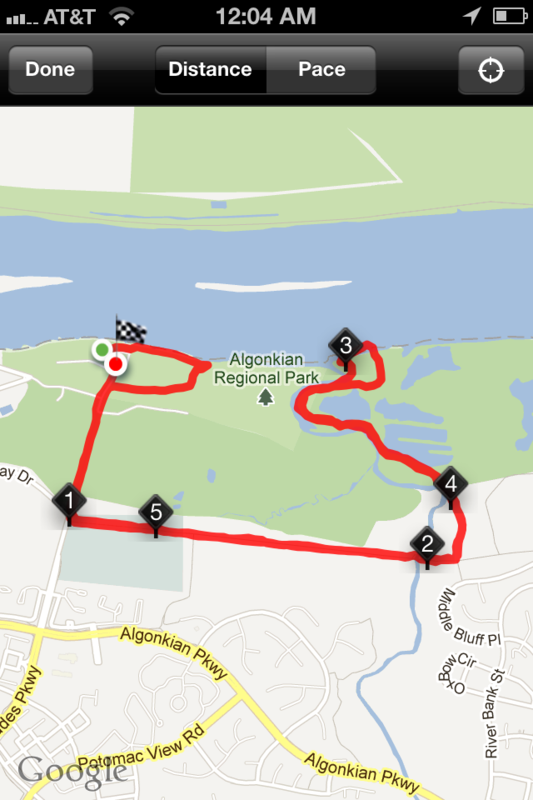 I found the “dense riverside forest” Sugarland portion of the race (between miles 2-4) to be most challenging. While trying to maintain balance in the mud, I saw the runner directly ahead of me nearly get mowed down by a herd of deer (and that’s when I took the headphones off). A few moments later I almost ran right into a group on horseback. Fun stuff. I was the first runner of the group, so after I managed the hand off (a bit awkward because I couldn’t quite catch the instructions at the beginning of the race), I got to relax. 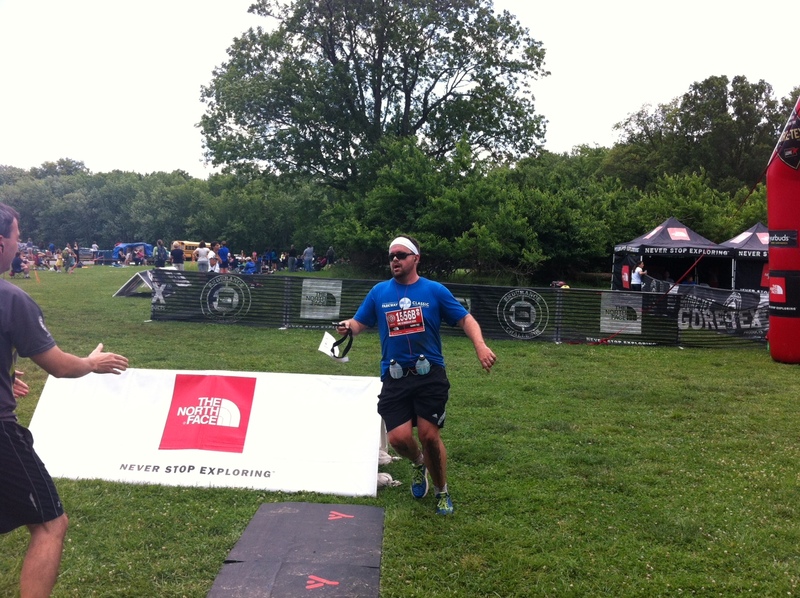 Here’s a shot of our second runner (my husband) handing off the “baton” (tri belt) to the next runner. At the end of the day, we came in 40th place. Not bad, considering the competition…but since my time was the slowest (10 minute miles), I feel like I have some work to do. First step: buying a decent pair of trail running shoes. Sadly, my Saucony Kinvaras didn’t cut it. Here is the link to the results. Photos will be available mid-week here. While I LOVED the race and the amazing support, trail markings, post-race fest, shirt screening, recovery tent, etc…..I have one small complaint: packet pick-up. I waited for nearly 30 minutes to pick up our material from staff using old-school paper copies on clipboards…and I arrived before the “lunch rush” on Thursday. Others I spoke to indicated their wait times were over an hour. It’s not the biggest deal, but the downside (from a corporate standpoint, at least) was that I didn’t have time to shop around after pick-up. As popular as this phenomenal race series is getting, I’d say it’s time to invest in some type of web-based check-in platform. 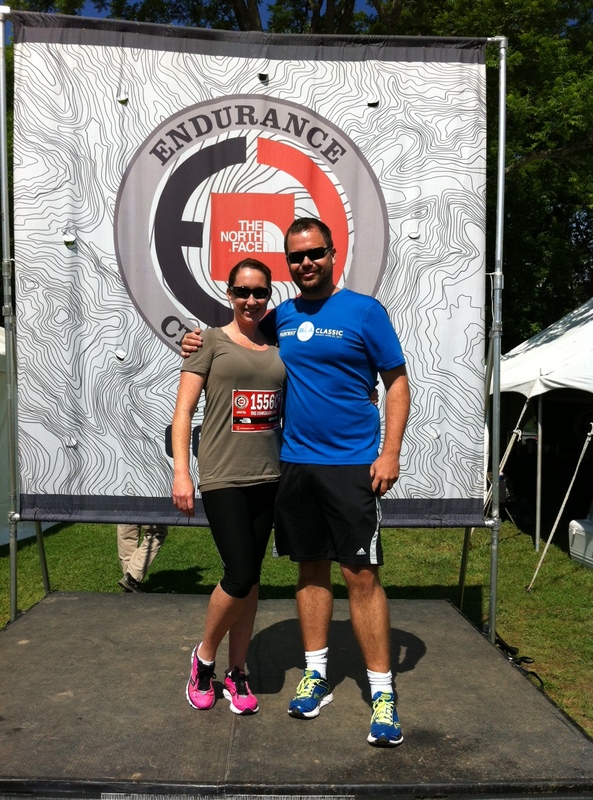 Again, great job to the Northface crew for the race! We’re definitely planning on a longer distance next year. Happy running!